A note to new readers: while we often delve deeply into financial topics (such as How A Year Of Extreme Frugality Changed Us and Strategic Luxury: The Difference Between Frugality And Miserliness), we also like to keep it irreverent and downright silly. Because hey, who doesn’t need an investigative interview series conducted by a dog?! And so, I hope you’ll enjoy Frugal Hound Sniffs! If you’d prefer a more, ahem, financial independence-related post, start here. It’s your trusty enterprise reporter, Frugal Hound, reporting for dog sniffing duty. I hope you enjoy this photo of me looking pensive and intelligent. I feel it truly captures my mission as a journalist–tough, but with an empathetic side. Speaking of press, my parents were in Boston.com yesterday, which is all well and good for them, but I note there was scant mention of moi… downright offensive I tell you. But back to the task at hand. 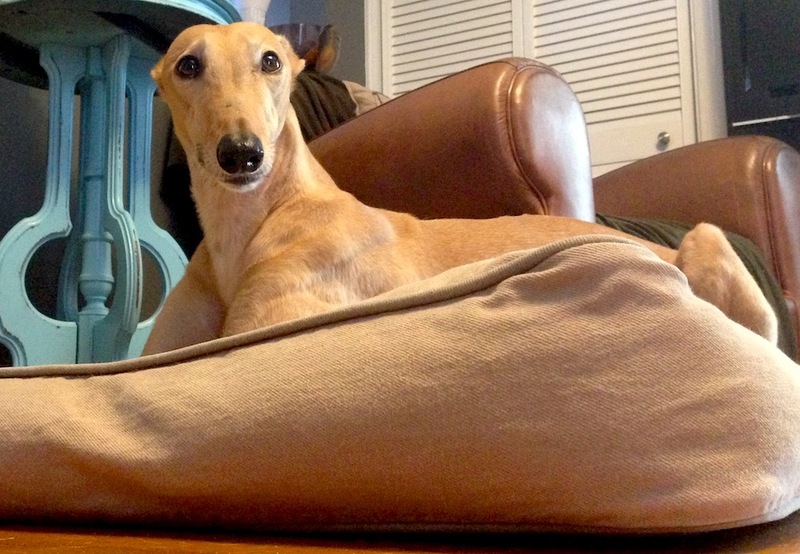 It’s my distinct houndy pleasure to introduce you to two small–yet fierce–hounds, Kami and Pixie from ShoeaholicNoMore! We’re Kami and Pixie the guard dogs of our mom’s house, yard, car, and anything else we can think of. Pixie is a purebred mini-dachshund and I, Kami, am a “mutt”. Mom says I’m probably 50% Jack Russell Terrier and 50% dachshund. I’m also the take-charge dog, so I’ll probably do most of the talking today. We also have a cat sister, but she ignores us most of the time, so we won’t talk much about her. Hmmph! We live in Kansas and we hate it because of the wild weather variations, but we can’t imagine leaving our mom behind to move to somewhere better. 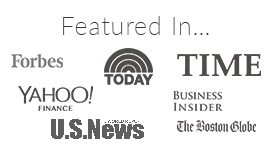 Our mom blogs at ShoeaholicNoMore and also at her newest site, Financial Conversation. Our mom saves money by always using coupons for purchasing our food. She also never buys us treats unless they’re on sale or she has a coupon. She rarely sends us to anyone else for grooming–only if it’s a charity pet wash. We also get to stay at our grandparent’s farm when she has to go out of town. We love it because we can run free and bark at everything, including the cows, since our grandparents don’t have a fence around their backyard! We absolutely love bacon! Real bacon is the best, but we will settle for Beggin’ Strips too. When mom gets the bacon out, we immediately start performing tricks without her even having to ask. We don’t get too excited about toys because we mostly like to wrestle around with each other, but sometimes we like to lick the mud, cow poop, etc. off the bottom of mom’s work boots after she’s spent a day helping on our grandparents’ farm. It’s so delicious! My sister, Pixie, isn’t really a destroyer. She did help herself to a pair of mom’s undies out of the laundry basket one time, but other than that, she doesn’t really like to tear stuff up. Me, on the other hand, I like to tear the stuffin’ out of every single soft toy mom has ever given us. I also like to rip the squeaker out of our tennis balls and then I wonder why they don’t make delightful noises anymore. It’s quite depressing. But the most expensive thing I’ve destroyed was probably a toss-up between a pair of my mom’s tennis shoes or my uncle’s work boots. I just love the smell of feet! Sometimes I get so excited when visitors come over that I pee on the floor. It doesn’t matter if mom has just let me go outside or not, I still pee on the floor! I also get really scared anytime mom buys something new for the house. When she got a BBQ grill, I barked at it for weeks before deciding it probably wasn’t going to hurt me. Pixie here. My most embarrassing moment is when my mom put me in a diaper for the first time and took a picture. It was terrible. Luckily, she doesn’t make me wear those anymore. Whew! Mom bathes us every 4-5 weeks. She says we stink like dogs. I don’t know what she expects, after all, we are dogs! I hate baths so much that I run all over like a crazy monster, rubbing myself all over anything fabric to get myself dry afterward. My mom just can’t get me as dry as I like to be. I also like to lick my whole body like a cat because I smell funny, like to clean, and I need to remedy the situation ASAP. Right now, mom is working hard to get her debt paid off. She also wants to quit her full-time job so she can work from home in her pajamas. Hopefully she’ll have more time to play with us then too! We miss her when she’s gone at work during the day. I don’t think I can name just one skill. I’m good at everything. Mom says I’m very smart and I like to please her, which makes me easy to train. But sometimes she says I’m too smart for my own good. 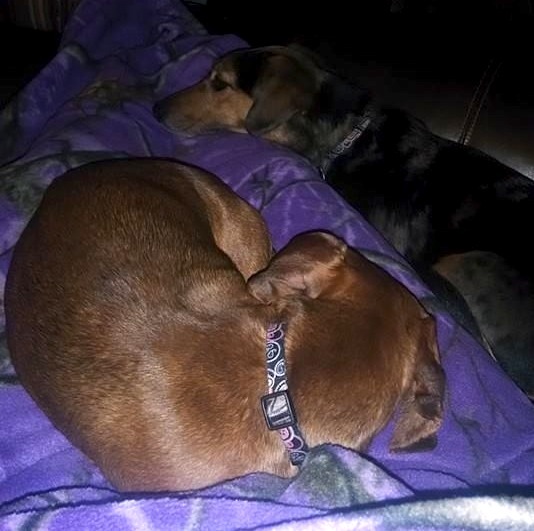 My sister Pixie isn’t good at much, she just likes to lay around and cuddle. Thank you, Kami and Pixie! I’m quite envious of your acquaintance with bacon. I myself have a mere passing knowledge of the food as my quasi-vegetarian parents rarely cook it–an injustice of epic proportion, in this hound’s opinion. Mrs. Frugalwoods here: Many thanks to Kayla from ShoeaholicNoMore for assisting Kami and Pixie with writing out their interview (it’s tough to type with paws, after all). Kayla is a mid-20s single girl living in Kansas. She is focused on paying off her consumer debt and student loans, while simplifying her life and closet. You can join her on her journey at ShoeaholicNoMore.com or follow her on Twitter @shoeaholicnomor. Doggie diapers! Whoa! I didn’t know such things existed. Maybe I need to get out more = ) She does look awfully cute in that diaper though! Very fun. Congrats on Boston.com feature! 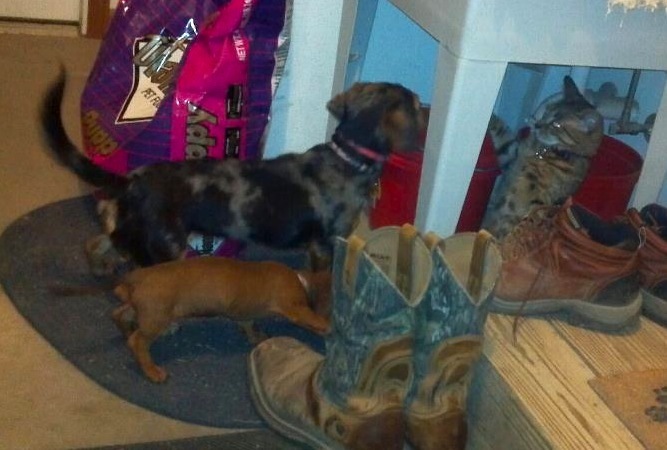 I have a dachshund, too! Cuties! Nice to meet you Kami and Pixie! Mmmmm Bacon! Right?! I love bacon too and my pups literally start spinning in circles and doing tricks when they smell it cooking. Hahaha I have a dog that loves to tear the squeakers out of toys too – I’ve given up on stuffed toys entirely because it’s two minutes of fun, and then fluff everywhere and a very sad look when I take it away before he can eat the whole thing. They don’t get soft toys much anymore for that reason too. The little one, Pixie, she’d love to cuddle with them but she can’t because Kami destroys them. No, it’s much drier here than it is in that part of the state. We also get a lot more wind too. Why thank you Christina! I hate wearing it though as it seems to reduce my ability to run around and behave like a normal dog. Wow! I just read the comments on the your Boston.com article and as an Oregon girl it was interesting to read comments from primarily eastern readers and their view on your lifestyle/retirement plans. One lady even wrote that she almost threw up thinking of dressing a newborn in used clothes. Really?!?!? My friends and I were always super stoked to get hand me downs. It must be a different world over there! Jessica, the Boston.com commenters are a special breed. I never read the comments because they are usually so hateful. Please don’t just us all by those characters. Most of us love hand-me-downs! I meant to say JUDGE not JUST. Yeah, they aren’t very nice. But that’s OK, this isn’t going to resonate with everyone :-). We are self-admitted frugal weirdos after all! A great frugal hound interview! Love the pictures; such sweet girls. I work at the PetSmart corporate office, so I get quite a few freebies and discounts, and the added benefit of bringing my little girl, Coco, to work sometimes. I always enjoy frugal hound sniffing around for frugal pet tips. I think cuddling is the best skill of any pet. Thank you, Frugal Hound, for yet another informative interview. Aww thanks Mary! My littlest one, Pixie, is quite the cuddle-er. Kami on the other hand is too much of a wiggle worm to do much cuddling. As a new reader, I am enjoying going through your archives. However, as the housekeeper to 3 greyhounds and a chihuahua, I love Frugal Hound and this series! I’m such a pet lover too, so I love this series. I just knew I had to be a part of it! Just saw your article in Boston.com and loved it! 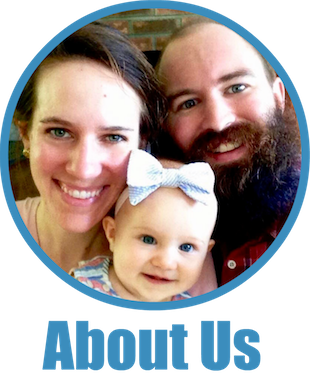 So fun to hear of another Cambridge family trying to live authentically and align goals with actions. We’re on a similar path and I look forward to following your blog! Kayla, Kami & Pixie are just adorable! It seems cow poop is just as delicious as horse poop, as one of my old dogs used to very much enjoy eating the horse “apples” off the bottom of my boots :). 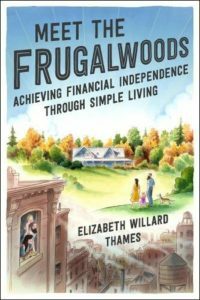 Frugalwoods, congrats on the Boston.com feature. Dachshunds are cool little dogs! Nice job on getting your debts paid off! That doggie diaper is both hilarious and adorable!! I miss Frugal Hound! So do my hounds! Any chance of seeing her any time soon?